Thank you everyone for your donations to our thrift store. I still do not have an opening date, I’m trying to get everything done in what time allows, but very soon. 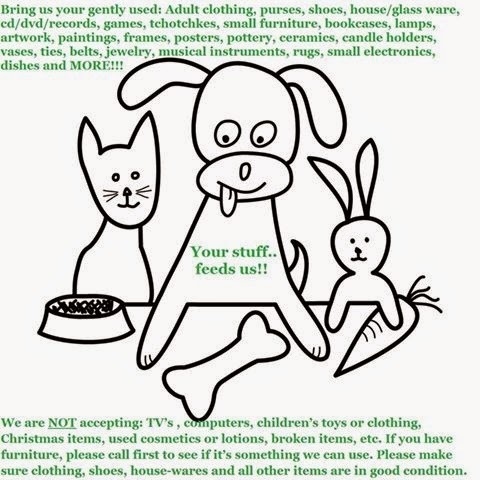 PLEASE keep in mind when donating items, we are trying to sell good quality items at a low price to help pay for pet food, vetting and overhead expenses. Clothing should be free of holes, tears, stains and pet hair. House wares /glassware should be free of food, dirt, mildew, and not broken. Electronics should be in working condition. Books, records, games should have the covers and all pieces. We are NOT accepting children’s clothing/toys,TV’s, computers or Christmas items (unless it’s something very unique or vintage).